With Dr.Explain you can easily create indexes for your help files. If you are going to make a CHM help file then you may add keywords to you project to create word index list. Each keyword is assigned to certain pages of help file. 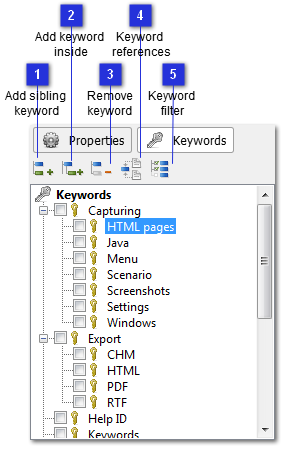 Activate a page in the project tree and check keywords you want to link to that page. Use toolbar buttons to add or delete keywords. This keyword index is not only listed in your documentation, but it is also used for topic search in HTML and CHM files.